In 2009, I had some great success with ebay building out niche stores, but Google all but killed off the whole niche store concept by deranking and penalizing them. So I moved onto other things. I was earning around $1,500 – $2,000/month in eBay Partner Network and Adsense income from one single niche store for a good 6-8 months, the the bottom fell out. But there’s one thing I learned: what works one day on the internet, doesn’t always work the next – but take advantage of it while it’s working. As a result of this little lesson, I made a strategic effort to diversify my income sources. I decided to try out EasyBay and bought the plugin. My initial intention was to add some eBay listings to the end of posts on my current niche sites. But my experience with mixing income sources on Amazon sites has shown that it decreases Amazon revenue, and the decrease isn’t offset by the new income source. Instead, I decided to try it out by building an Ebay based niche site. While I’m not going to go into specifics on the niche just yet (I will later, once is ranks), I will walk you through the process I used. This will be the fifth niche site I’ve built in the past year or so and part of my overall strategy to build out 10 sites earning at least $500.00/month. I would then build an 11th site, grow it to $500.00 and then flip the lowest earning site of the 11. Then start another one. Before you go any further, for this strategy to work for you, you’ll need to be a member of the ebay Partner program. If you aren’t already a member, you’ll need to apply. ebay’s partner program can be a bit difficult to get accepted into. If you aren’t already a member, I would suggest building out the site with content, then once you have traffic and a good amount of content out there, then apply. So I’m ready to build out a new niche site, using eBay as the product source … Now what niche should I target? This is always the tough part. Once you decide on a niche, building out a site is really pretty easy. The trick to finding a topic is really just to pick one that you think you can do well with, pull the trigger, and don’t look back. For those of you that have used ebay, you’ll know that the product options there are generally larger than Amazon. Why? Because eBay not only sells new products, but used and handmade products as well. As a matter of fact, finding used items is one of the big attractions with using eBay. Thinking through that actually narrowed down the options for me a bit. I decided that for new products, Amazon worked well, so my new ebay niche site would promote used or handmade products. Next, I skimmed the product categories on ebay, along with taking note of some of the more popular items up for auction. This led me to remember the ebay is a popular place for collectors to both buy and sell collectable items, and that collectors items, especially rare ones, can sell for a lot. But what collectors items would be good? This is where keyword research came into play. I like to pick niches that I have a personal interest in. I’ve found that if I don’t, I lose interest and I’m guilty of not keeping the site updated like I should. Now part of that is due to me doing most of the writing on my sites. If I outsourced all of the writing, it probably wouldn’t matter. With keeping my personal interests in mind, I wrote down a list of collectable items I like. The list included old photos, Nascar memorabilia, coke products, cigar boxes, old computers, and a bunch of other items. Once I had a decent list, I moved onto keyword research. I don’t care what all of the “experts” say about “semantic web”, keywords are still a huge factor in how successful your site will be. In the past, I’ve focused on finding one keyword phrase that gets around 3,000 – 5,000/month US search hits per day. The site is built focusing on that keyword phrase, and then finding lots of longer tail key phrases that are used to build supporting content. What I’ve found is that those longer tail keywords often add up to be larger amounts of traffic that the primary target keyword. Given this, I decided to take a little different approach with this eBay based niche site. I decided to focus on 5-10 lower volume and longer tail keywords. I looked for keywords in the 800 – 1000/month global range. I’m not really sure if this is a better or worse approach, but I wanted to try so I could learn and find out. I pulled up Market Samurai and Long Tail Pro and began researching. I like using both tools, as they each provide a little different data. Although if I had to pick just one tool, I would go with Long Tail Pro. I spent a considerable amount of time doing my research over the course of a few days. I ended up choosing a collector’s niche that met the goal of having 5-10 keyword phrases that get 800 – 1000/month searches. They are also “buy keywords”, meaning they should convert well. With my niche selected, I began building out the WordPress site. I first chose a domain name. I kept it simple and directly related to my niche. I’m not going to disclose the domain name or niche, but as an example, let’s say I elected to go with Nascar products, a good name would be something like “nascarcollector.com” or “thenascarcollector.com”. I checked and the domain was available, so I bought it for 2 years at MyDomain.com. Namecheap is also another great domain registrar. Fortunately both the .com and .net were available, so I booked both of them. Never hurts, considering how inexpensive domain names are. Next I followed my standard process of starting a blog. Blogs and niche sites are very similar under the covers, the difference is the content and layout. I elected to use a new favorite theme of mine, Jarida. I’m pretty decent with Photoshop, so I did my own logo and color scheme. If you aren’t good at graphics, just use Fiverr to get an inexpensive logo done for you. A Main landing page which provided and overview of the topic and why collectors enjoy it. I also overviewed all of the various items in this niche that are popular with collectors. These will link to my pages. I picked the top 6 traffic keywords, and created a page for each. I added each page to the menus, and began writing the content. I spent about a week, off and on, writing and researching content. I then installed EasyBay and EasyAzon. I added a list of 20 “most watched items” to the sidebar along with a few Amazon related products. Here’s a tip for using EasyBay. The widget it comes with only lists the text names of the items, and doesn’t show a picture. Text listings don’t covert well. After a bit of trial and error, I figured out how to get around this. Install a plugin called the short code widget. Create a new post, and generate the EasyBay short code by pressing the EasyBay button at the top of the post editor. You can use whichever output type you want. I general use “Most Watched Items”. Copy the generated EasyBay short code, then add a Short Code Widget into your sidebar. Paste the EasyBay short code into your widget, press save, and your items will now be listed with pictures. One feature I really like about EasyBay, is that their listings contain a realtime countdown of time remaining on auctions. This creates a sense of urgency for the browser/buyer. My plan is to add ebay item listings into the content pages as well. But I plan to do that later once the site starts ranking. Joined a few groups dedicated to the niche, and have been active and have included posts in the group I shared on my Facebook page. I also share group posts on the page as well. I feature a “Collector’s Daily Pick” each day or every few days that highlights a really good buy I find on eBay. The link I share is an eBay affiliate link. Using FPTraffic, I also throw in a few videos and Amazon items. The Facebook page has grown quickly (almost a 1000 likes), and is the primary source for the website traffic right now. Right now the site isn’t ranking for any keywords. The site has been in the Google sandbox now for almost a month. Prior to this site, I was ranking with other sites in as little as two weeks. Definitely a sign of the new Google Sandbox changes that are in place. I’m really hoping it doesn’t take 4-6 months to rank like I’m seeing some experts say. Currently I’m getting clicks on the eBay items, but no buys just yet. Not surprising considering the low level of traffic. I have received commissions for a few Amazon items, but only small change. Again, not surprising considering the low levels of traffic. I have about 10 different blog articles I’m going to write, and plan to start on those this week. I might end up outsourcing some of this content using iWriter. Depends on how much time I have this week and next. My goal is to get the site to about 15-20 pages of content, and then just let it sit until it starts ranking. Then I’ll begin building some back links using my PBNs to boost the ranking. In the mean time I’ll continue to grow the Facebook page, as honestly it’s kind of fun and I’m enjoying it. I’ll keep you posted on how the site’s doing. 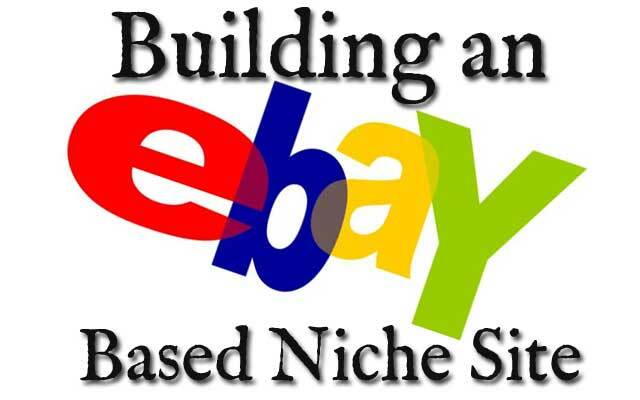 If you decide to try out an ebay based niche site, let me know and keep me posted on your progress. Oh, and let me know what you think of EasyBay. Very interesting strategy with the facebook page – that is something I’ve never thought of before, and am glad that it is working so well for you. Have you considered trying to monetize that with teespring or similar? I have a soft spot for eBay as that’s where I got started a long time ago. Looking over the eBay affiliate agreement is not getting me excited though..